In a new home, in a new place, living our life as always!! It’s awesome! And this internet is soooo much better than my last one so you’ll be seeing lots more from me this coming year. We will also be coming back with more reviews from the Homeschool Review Crew! That’s right, we were asked to return for 2018! I’m so excited to share new reviews with you all this year. We love using these products for our homeschooling and our reading fun too. Look forward to some videos this year as well. My 17 year old is really getting into videos so he’ll be helping me to grow this blog with video reviews. I’m excited for this addition. He is as well. So I’m going to keep this short and sweet for now but look for lots more to come to our little blog very soon. You may remember that around Halloween we did a review for Let The Little Children Come. It was an evangelism pack of pumpkins to be shared with others in order to share God’s word during a Holiday many choose not to celebrate. It was a great way for Christians to reach out and speak to others about Jesus at that time. For this review, we were sent the Gospel Tracts and Evangelism Tools Sampler Pack from Let The Little Children Come. These products are an awesome way to reach out and share the gospel with others. This packet contain 10 colorfully, engaging items that are designed to share God’s word with children. 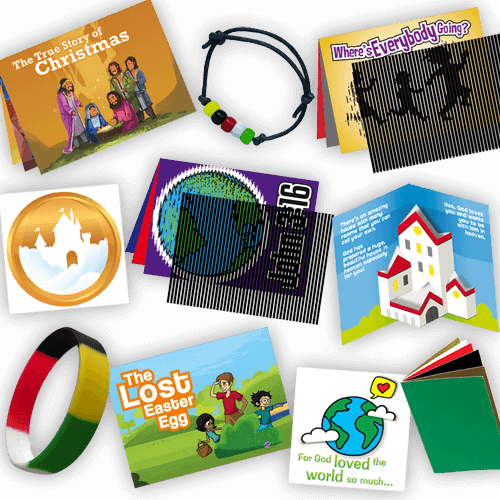 Button flip-outs, The True Story of Christmas Animated Tracts, The Lost Easter Egg Pop-up Tract, a Silicone Salvation Bracelet, a Wordless Bracelet Kit and much more help children link God’s word to their lives and helps you as a parent or advisor to make this happen. The Bible tells us to reach out and share the Gospel with others. It tells us that our children are the place to start building a love for the Lord. These wonderful tools help to make that happen by giving Biblical quotes for our children to build upon, by giving them physical items that point them towards Christ’s love and by leading them to learn about God’s greatest gift to the world. Each item that fills the Gospel Tracts and Evangelism Tools Sampler pack is specially picked to assist you in bringing your children, or the children in your life, closer to Christ. Each item has a different lesson and meaning to help you make this happen. Each item is special and unique for this reason. The Gospel Tract and Evangelism Tools Sampler Pack is available for $11.95 per pack from Let The Little Children Come. You can find Let The Little Children Come on Facebook! This Crew year is coming to an end for me. Due to our move, I haven’t been able to sign up for new items. I have greatly enjoyed our year on the crew but I also look forward to a mild break. Our life is filled with new adventures now. We are seeing lots of new places and doing new things. Honestly, we’re able to do things I never thought would be possible in our life and I can’t wait to see where the Lord is leading us in this season of our life. Is life perfect? No way but it’s pretty good right now and that’s all one could really ask for. God has a plan and he’s leading our way. With Him, we cannot go wrong. Carole P. Roman has become one of my favorite authors for children’s books. Her books are just beyond description. Written for children to help them better understand History and Science. For this review, we were gifted four books, all written by Carole P. Roman. Two were books that we chose and two were books that Carole chose for us. We are very thankful and love all four books which we received. Each of these books are uniquely written telling differing stories written specifically for children. I will tell you more about each through the course of this review. I’m sure your family will enjoy them as much as we have. I chose this book for Laycie. I thought she’d like the story of the young girl, Susannah. She’s currently into stories that she can relate to about children her age. This is the first book in the Oh Susannah series, which I chose so she could follow the series and not miss out. Susannah is a mischevious child in some ways. She’s a little unsure and a little overwhelmed by life. Susannah’s day starts rocky with her parents’ troubles spilling over on to her day. Susannah’s Mom tells her to “eat her banana” but instead she sticks the banana into her book bag and takes it off to school. Then Susannah is given several other things throughout her day which also get stuffed into the bag. The bag gets heavier and heavier, as does her heart dealing with so much. Finally, Susannah makes it back home and shoves the bag under her bed but her strange and anxious feelings do not go away so she tries to take it back out. Her bag then bursts open showing all her shame and issues from the day. This story has a happy ending when Susannah’s parents step in to help her deal with her problems and realize that Susannah is most important, more important than work or anything else they have to deal with. Susannah realizes her parents love her no matter what happens or what she does in her day. This encouraging story is perfect for any child. Do you have a child who loves space? Have you been looking for an adorable children’s story for your little Rocket Man? Rocket-Bye is the perfect bedtime story for your future astronaut! Rocket-Bye takes your child on an adventure through the solar system. It’s a great introductory book for young children to learn their planets and about common constellations. A beautifully illustrated adventure you won’t wish to miss. My five year old loved this book. He loved watching the rocket ship soar by each planet and learning more about them. The story is a simple rhyme but teaches so much on each page. This is a Captain No Beard tale. Fribbet the Frog is a member of Captain No Beards crew and he’s not thrilled about the Tadpoles that are aboard the ship. He’s not so sure these little guys are such a great thing. But Captain No Beard explains that he once wasn’t sure about his little sister either. Over time though she grew on him and he grew to love her. He assures Fribbet that he will do the same with his new brothers and sisters as well. This story is really great. It helps kids learn about the life cycle of a frog in a unique way. It is also a great book for children learning it’s okay to have a new sibling. A unique story that covers many angles. I chose this book for Jackson, though I had no idea what the story line would be. He and I loved that it showed so much information about the life cycle of a frog. The pictures are awesome. This quickly became one of Jackson’s favorite books. Carole P. Roman is an amazing storyteller and historian. The first books we reviewed for her long ago were from her If You Were Me and Lived in… series. There’s a TON of books for this series now. If You Were Me and Lived in… the Ancient Mali Empire shares the history and present life of the people of the Mali Empire. Mali means hippopotamus and the people lived from 1230 to around the 1600’s. Mali was a small part of the kingdom of Ghana. Niani was the capital. They spoke the language of Mandinka. This book is packed full of information about the Mali Empire and the people who lived there. It’s written for children to understand and to learn from. The book series is a great way to teach history and geography to children. All of Carol P. Roman’s books are just amazing for children. So many lessons and stories to learn from. These books are a great addition to any library and for families every where. Carole P. Roman books are available online through Amazon or on her website. Chara Games is a Christian based game company that provides great games like Unauthorized for gaming fun. Chara Games encourages a strong relationship with God through their wonderful games. They create an opportunity for Christians to learn and to grow in their faith through their great games. Every day Underground Churches are formed in places where God’s word is NOT welcome. People must keep their faith hidden so they are not persecuted for their personal beliefs. These “unauthorized” church parishioners face the challenge of being caught, yet their faith is more important to them than anything else. Through Unauthorized you can experience the challenges that these folks face daily in believing in something that others do not support. Through your choices in the game you can grow your church or you can stamp it out. Your choices make the decision as to what happens, just like in real life. The outcome is always based on what the players choose. This game is not an easy one to play. It takes about 30 minutes and you need at the least 6 to 12 players to play it but it can be adapted and played with just 5 people if that’s all you have. However, it’s not made for less than 5 people at all. Every player in this game has a role to play. They use their unique powers to sway the other players to one side or the other: to build the church or stamp it out. However, players can change sides during the game so you can never be sure who is one your side and who isn’t. Much like every day life. Because the other players positions can change and sway each other as well, the game can really go in any direction. Those who you think are on your side, are not. Those who you may question their support may very well be on your side. It’s all in the cards. Some of the roles included in the game are the Police, the Pastor, the Merchant, the Thief, among many others. Each of these roles hold a significant part to the game and each part effects how it’s played. There are also Experience Cards which help influence the choices made in the game. Experiences like disease and sickness. And Experiences of the exact opposite: Joy. These can either make or break the game. Originally, I had planned to play this game with my kids and my best friend’s niece and nephew. I also planned to play with my husband and I and the kids. But because we needed to move during the review period, the original plans changed. So instead we have allowed our children to play the game with their cousins. That’s a total of 8 kids and they really enjoyed it. There are so many scenarios that can happen. The game really never gets boring. It was interesting to see the differences in choices between our public schooled nieces and nephews and our own children as well. In the end, the game has worked out well for us to play. Unauthorized is available for purchase on Amazon for $16.66. It is a card game requiring at least 5 players but 6 to 12 is preferred.